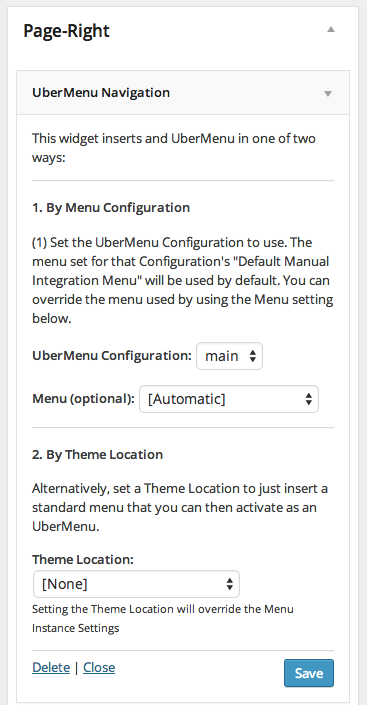 UberMenu includes a special Widget which can be added to a widget area in your theme. 1. Navigate to Appearance > Widgets. 2. Drag the UberMenu Navigation widget into your desired widget area. You can choose a configuration (this will normally just be the “Main” configuration) and a specific Menu (from Appearance > Menus) to display. You can insert the menu for a specific Theme Location into the widget area. The menu assigned to that Theme Location will appear. Normally you would ignore this option, as widget menus tend to be secondary menus without Theme Locations. 4. Save your widget. The menu settings for the widget are controlled through the UberMenu Control panel for that specific instance.